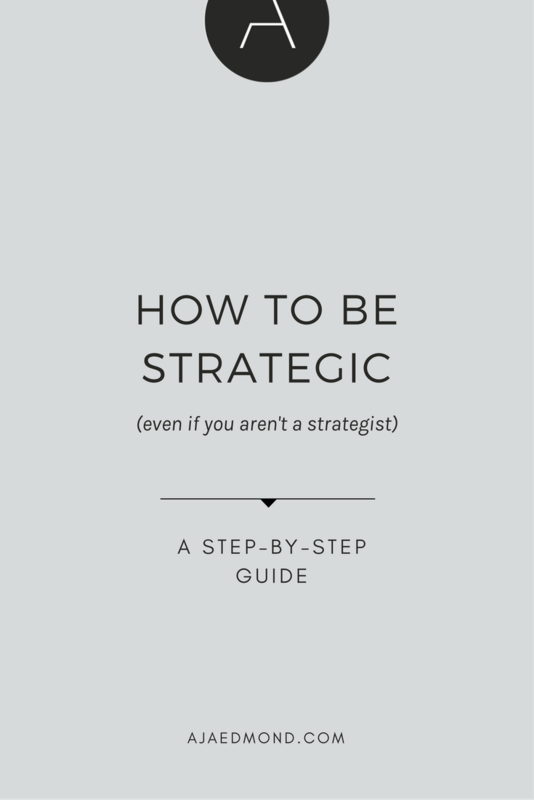 Here's why and how you can be more strategic in your work and business — even if you aren't a strategist. From my experience (not just as an INTJ but also someone who has worked for dozens of brands as a business coach and brand strategist) I agree with her assessment. Many professionals don't understand or respect the role of strategy or falsely believed they are strategic. However, self-awareness and a recognition of the skills you have (and don't have) is important if you are to effectively run a business or progress in your work. That said, I want to provide six tangible ways in which you can develop and incorporate strategic thinking into your day-to-day even if you aren't a strategist. Need a robust set of resources that'll help your life and business thrive? A process is a set of structured steps and timelines that you follow to get from A to Z. When you operate under a process you are much more organized and aware of the critical functions that drive your business. As you move through the steps you bring to the forefront of your mind things that need to be handled. This forces you to think about things you would otherwise miss. Now, if you are running a little side hustle perhaps you don't need a formal process. But if you are in any way trying to ramp up your business, get on top of this first and foremost. For some reason many creative people I've worked with believe this myth that process stifles creativity and innovation. That's a complete lie. Running around like a chicken with your head cut off stifles creativity. Rigidness and the inability to be agile stifles creativity. Stubbornness stifles creativity. Silly rules created by incompetent, bureaucratic, or small-minded people stifles creativity. But having a clear and repeatable checklist allows you to constantly drive the things that bring success (and identify the things that no longer work). I'm alarmed at the number of entrepreneurs who don't stop to think about what they are doing and why. The most dangerous word in startup lingo is "execution". In the absence of a solid game plan, what the hell could you possibly be executing against? Want to know why the US lost the Vietnam war? Much of the analyses sums it up to poor judgment and lack of a legit strategy as a result. In his masterpiece, On War, Carl von Clausewitz observed that the ‘first, the supreme, the most far-reaching act of judgment that the statesman and commander have to make is to establish ... the kind of war on which they are embarking; neither mistaking it for, nor trying to turn it into, something that is alien to its true nature. This is the first of all strategic questions and the most comprehensive.’ Unfortunately, U.S. foreign policy decision makers in the mid-1960s committed a supreme act of misjudgment by intervening directly in the Vietnam War. Intervention proved calamitous. It is critical to think then do. Think then act. The two go hand in hand. Implementation is useless without the meat that rationalizes it. If you can't see the forest for the trees you have a problem. You've got to craft a greater vision for your business and then concept out what it takes to get there. This is the key strategic trait: the ability to be future-oriented AND conceptualize how you can achieve that vision. It doesn't mean that your head is in the clouds and you aren't present enough to tackle the current realities of your business. It means, as Penelope stated, you move beyond "what is and focus on what could be". As a creative startup, please don't overwhelm yourself trying to follow Porter's 5 Forces and all these super technical frameworks that are really intended for sophisticated companies (many of whom barely understand them, if you want to be honest). You will get so lost. I learned many of these complicated frameworks in business school and constantly have to refer back to the material to recall all of the different elements. And, I still only draw out a few insights that work for me as the owner of small lifestyle businesses. There are a few frameworks such as a SWOT analysis and establishing a USP that are relatively simple to understand. However, don't get too caught up in highly technical business speak at this stage in the game. Start with the basics. There were a few times (back in my Corporate America days) when I almost had a mental breakdown trying to keep track of the myriad of utterly useless metrics that senior executives got hyped up about instead of being laser focused on what mattered. You need to know your limitations as a small business or startup entrepreneur. Your brain only has the capacity to handle so much. Nowadays I care about adding value to the people I want to help with my business. I gauge that very simply by periodically asking (a) is my audience growing, (b) are clients happy with the outcomes (c) am I generating income on par with the value I'm adding? When I start to notice a pattern over time where one or more of these is out of whack, then I get stop what I'm doing and shift all activities back to these fundamentals. Hindsight is 50/50. It means keeping it real and actively exercising self awareness. Looking back helps you identify what works and what doesn't. Then you can apply critical and creative thinking to alleviate the problems and enhance your opportunities. Here's the catch: a sneaky little thing called hindsight bias. That's when you falsely claim to yourself or others that "you knew it all along" and subconsciously rewrite history in your own head, distorting the facts and completely missing the opportunity to learn and improve. Perhaps because I'm an INTJ, I tend to be so hard on myself that I'm actively seeking areas in which I've fallen short. But if you aren't that self-critical you have to incorporate tactics that help you overcome this and other mental biases. Otherwise, you are going to psyche yourself out about critical flaws that could undermine your success. So again, you may not have innate strategic abilities (or the money to hire a strategist for your startup or small business) but as an entrepreneur you must get used to wearing different hats. Strategy is not out of reach for you, or anyone else, who is open to training themselves and developing a thoughtful mindset.